Modern Haifa is a bustling port town, but unlike many industry-focused cities, its landscape of steep cliffs rolling down to the shore gives it a beautiful setting. This is enhanced by the enormous and thoroughly beautiful Baha'i Gardens, which dominate the central city in a series of cascading terraces and is the town's number one tourist attraction. This major highlight in any Haifa sightseeing itinerary is also an example of the modern town's overall harmonious approach to life. As well as being a center for the Baha'i sect, Haifa's mixed population of Jews and Arabs is much less segregated here than elsewhere. The extraordinary Baha'i Gardens are top of the things to do list in town, and the Baha'i Shrine, with its golden dome, is the city's landmark monument. It contains the tomb of Iranian Mirza Al Mohammed, who declared himself "Bab" ("gateway" to God) in 1844 and founded the Baha'i faith. Ali Mohammed was assassinated in Tabriz (Iran) in 1850, and his successor, Mirza Hussein Ali, who became known as Bahá'u'lláh, fled to the Ottoman Empire where he proclaimed himself Imam in 1868. He died in 1892, having been held in captivity at Akko for 24 years. His followers secretly brought the remains of his predecessor, Mirza Ali Mohammed, from Iran to Haifa and built his tomb here. Today, the terraced gardens and shrine are an incredibly tranquil and beautiful memorial as well as an immaculate example of garden landscaping. UNESCO has declared them a World Heritage Site for their cultural as well as natural beauty. For those of the Baha'i faith they are also an important place of pilgrimage. The Shrine of the Bab, towards the top of the terraces, contains the tomb of Mirza Ali Mohammed. The present Stella Maris Carmelite Monastery was built in 1836 and is noted for its lush frescoes portraying St. Elijah. The interior also contains paintings of scenes of the lives of the prophets Isaiah and Ezekiel and has a cedar figurine of the Virgin known as the Madonna of Mt. Carmel. The Carmelite order was founded on Mount Carmel in 1150 as a hermetic Catholic sect. When the order sided with Napoleon during his battle against the Ottoman Turks in 1799, the Carmelite monasteries were destroyed. In front of the building is the tomb of the French soldiers who were killed during the battle. Afterwards, this monastery was rebuilt but was again razed in 1821 by the pasha of Akko (Acre). A small but interesting museum is in a room adjoining the monastery entrance. From the monastery, a trail leads down to the grotto known as Elijah's cave, believed to be either the one-time dwelling place or tomb of Elijah. The Haifa cable car is the easiest way to get up the steep hill to the Stella Maris Carmelite Monastery and by far the most fun. There are excellent panoramic vistas over the city and its major points of interest all the way up, making this an excellent activity for photographers. Even if you're not interested in visiting the monastery itself, the views from the lookout point at the top of the hill, across the sprawl of Haifa and out to the Mediterranean, are well worth the ride to the summit. Opposite the Stella Maris Carmelite Monastery, a path leads down to Elijah's Cave at the foot of the cape. Believers hold that Prophet Elijah hid here after killing the priests of Ba'al. It is an important pilgrimage site for Jews, Muslims, and Christians alike who all hold Elijah in high regard. If you're going to visit, remember to dress modestly to respect the pilgrims who might be visiting the site at the same time. Until 1948, the site was a mosque. Ben-Gurion Street is the old main street of the German Protestant colony founded here in 1868 by members of the Society of the Temple, who believed that settling in Palestine would bring about the Second Coming. The society continued to exist until the Second World War. The old houses, with their tiled roofs, have all been spruced-up and are very characteristic of their period. The street is now home to Haifa's best dining and shopping. The cemetery of these zealot settlers lies to the northwest, at 150 Jaffa Street, next to a British military cemetery of the First World War. Haifa has two main beaches for sand frolickers. Bat Galim Beach is a favorite with water sports enthusiasts. Windsurfers and kiteboarders take to the waves on sunny days, and you'll find water sports operators here who rent equipment and give lessons. Hof HaCarmel Beach is more about laid-back sunbathing and general lounging and is a favorite haunt for local families on sunny weekends. Both beaches have excellent facilities, with cafés along the shore and sun shades and sun loungers for rent. This excellent, well-curated museum is a must-stop for any art enthusiast. It contains the paintings and sculptures of Mane Katz, who was an influential 20th-century Jewish artist. As well as his Expressionist art, Katz was a great collector, and his personal collection of Judaica and antique furniture are on display here. Just down the road is the Tikotin Museum of Japanese Art (89 Hanassi Avenue), which features exhibits of Japanese artistry from the 14th century right up to the present day. This lovely public park is full of gorgeous bronze statues and is a great place to relax after a morning of sightseeing. The statues were all made by German-born artist Ursula Malbin who lives part of the year in Israel. If you're travelling with children, they'll love exploring the well-maintained trails through the park and peering at the quirky monuments. In the early evening, plenty of Haifa locals come here for a stroll so it's a great place for a spot of people watching and to check out local life. If you have kids in tow, make a beeline for this interactive science museum that will keep kids - both big and small - thoroughly engrossed and amazed. The museum's stately building was once the base for Israel's Institute of Technology and was erected in 1913. Inside, there are all manner of science-based exhibits, from zany and colourful chemistry displays to exhibits explaining aviation and green energy. It's a great example of how to make science fun and accessible for all ages. Halfway along the coast, between Haifa and Tel Aviv, Caesarea is home to one of Israel's most fascinating ancient sites. The site has been occupied since the 4th century BC, when the Phoenicians built a harbor here, and went on to become an important town for the Greeks and Romans. 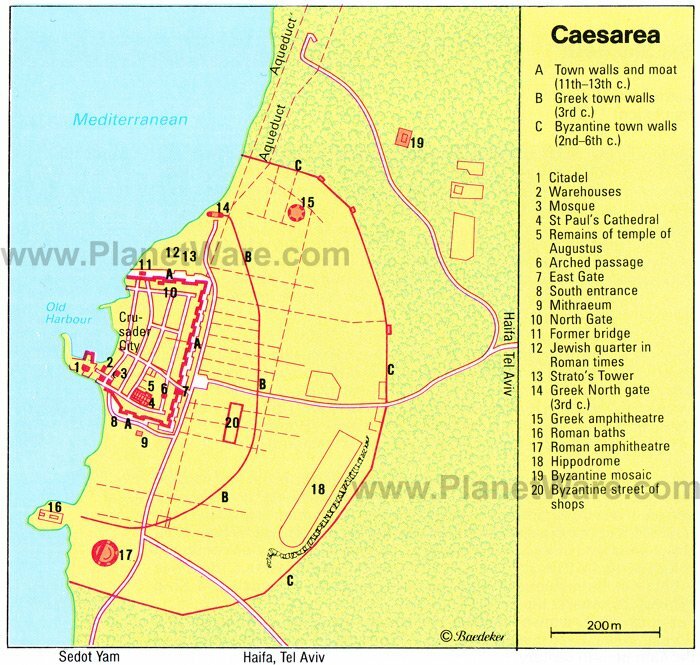 Herod the Great named the town Caesarea in honor of Emperor Augustus. It was during this period that the city really bloomed with temples, a theater, hippodrome, and busy harbor. By the 1st century AD, Caesarea was an important Christian center, but its era of grandeur ended with the Arab conquest in 637 AD. Archaeological investigation of the site continues, and a number of important finds from the site, including a figure of Artemis of the third century BC and an important Byzantine mosaic, are now in the Israel Museum in Jerusalem. The Crusader city remains and Roman theater (within the archaeological park itself) and the gorgeously melancholy remnant of the ancient aqueduct (upon the beach), that was part of the city's Herodian period, are the three highlights of a visit here. If you have your own wheels, tooling around the slopes of Mount Carmel makes an excellent day trip from Haifa. The big historic sightseeing attraction here is the Carmelite Monastery of St. Elijah, where according to tradition, Elijah set up an altar during his conflict with the priests of Baal. The small settlements that speckle the slopes of the mountain are just as interesting as the church, if not more so. Ein Hod is an artists' village riddled with galleries. Bet Oren, on the lower slopes, is where the remains of the "Carmel Man" (a Paleolithic skeleton unearthed in caves six kilometers west of the actual village) was found. The remains, and other finds from the site, are now in Jerusalem's Rockefeller Museum. A favorite weekend hangout for stressed out city folk from Haifa, Dor is home to one of Israel's most picture-perfect beaches. Although today people mostly travel here for the pleasures of sun, sand, and sea, Dor has a rather illustrious history. Excavations here, just to the north of the modern town, have brought to light remains of the old harbor, a Crusader castle, and a 6th-century Byzantine church. If you can manage to drag yourself away from the beach, the ruins are well worth a look. This fascinating archaeological site, recently declared a UNESCO World Heritage Site, is particularly notable for the impressive catacombs excavated by B. Mazar in 1936, and later, by N. Avigad. Although the site has been dated back as far as the Iron Age, most of the ruins that can be seen today date from the 2nd century AD, when the town enjoyed a heyday as an important rabbinical city. Archaeology buffs will find the ancient remnants of Jewish life here engrossing. Atlit is home to two interesting historical sites. Atlit Crusader castle dates from 1200, when it was known as Castrum Peregrinorum or Chateau des Pelerins (Castle of the Pilgrims). Unfortunately, these days you can't enter it as it is on military land. Much more recently, Atlit was the destination where Jewish immigrants, endeavoring to flee Nazi Germany during World War II, ended up being held when they arrived in Palestine. The ruling British held them here at Atlit Illegal Immigrants Camp, which has been preserved for posterity. The National Maritime Museum holds a collection of model ships, maps, and charts that illustrate the history of seafaring in the Mediterranean region. Anyone with an interest in maritime history and in the leading role the Mediterranean played in shaping the centuries of human history in this region will enjoy a visit. Just down the road is the Clandestine Immigration and Naval Museum, which documents the Zionist movement's efforts to get Jewish refugees into Palestine during the British Mandate period. Haifa's large university complex has a clutch of museums and attractions that make for some interesting sightseeing. Of particular note, the Eshkol Tower here has an observation deck for panoramic views across the city, and the tower's ground floor is home to the small Reuben and Edith Hecht Museum, with exhibits that trace Jewish history in the Holy Land pre-Diaspora. If you're interested in ancient history it's worth a stop. Although it was destroyed in the 7th century, Haifa was famed in the 11th century for its shipbuilding and its Talmudic college. In 1099, it withstood a six-month-long siege by the Crusaders, but was finally destroyed. In 1187, Saladin captured it from the Crusaders, but in 1191 it was recovered by Richard Coeur de Lion. The Crusaders were finally expelled from the town by Sultan Baibars. The monasteries of the Carmelite order, which was founded in Haifa in 1150 by a monk named Berthold, were destroyed after the fall of Acre in 1291, when the monks returned to Europe. 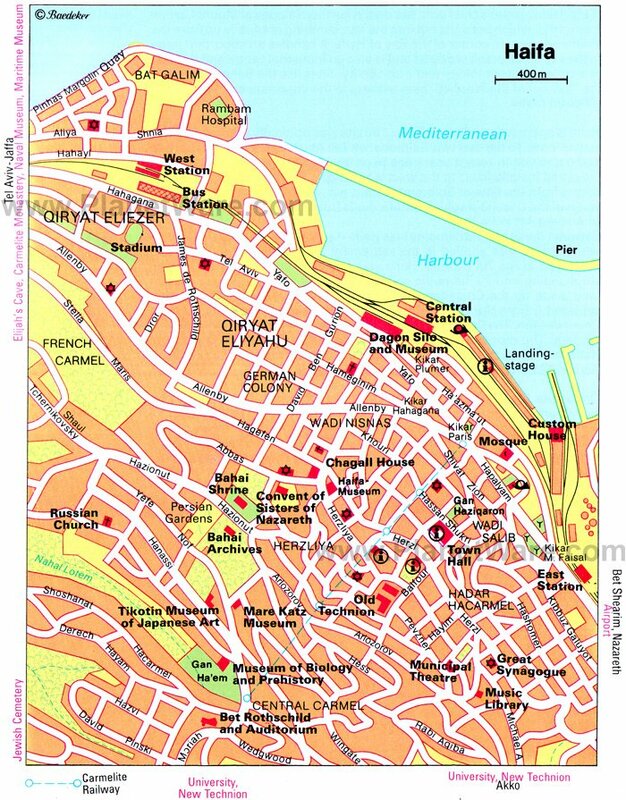 Under the Mamelukes (from 1517) and the Ottomans, Haifa was an insignificant fishing village. In 1740 Daher el-Amr, lord of Galilee, took the place and founded a new settlement, the present Old City, between Kikar Paris (Paris Square) and the Head Post Office. He also developed the harbor for the export of grain to Egypt. Under Ahmed el-Jazzar, who succeeded Daher in 1775, the Carmelites were able to re-establish themselves near Elijah's Cave. In 1799, during Napoleon's advance on Akko (Acre), their monastery was used as a military hospital, but after Napoleon's withdrawal, the French wounded were killed by Ahmed el-Jazzar. The importance of Haifa increased with the coming of steamships, for which the nearby harbor of Akko was too small. In 1868, the population was increased by the arrival of German settlers, members of the Society of the Temple. When the German Emperor, William II, visited Haifa in 1898, a jetty was constructed, and thereafter the development of the port continued. The emperor promoted the idea of linking Haifa with the Hejaz railroad and thus opening up the town's hinterland. The upswing in the economy led to the expansion of the Old City to the northwest, in the direction of the German Colony. The first Jewish school had been established in 1881. Christians from Lebanon and Arabs also now moved into the town, and two sects that had broken away from Islam, the Baha'i from Iran and the Ahmadiya from India, made Haifa their headquarters. In September 1918, British forces occupied the town. Thereafter, a new railroad line was built, linking Haifa with Egypt by way of Gaza. New industrial installations came into being. This development continued in spite of conflicts between the Jewish and the Arab populations. The modern deep-water harbor was completed in 1933, followed in 1934 by the development of the oil terminal at the end of the pipeline from Iraq. In 1936, following further outbreaks of violence, the Jewish population left the eastern part of the lower town and concentrated in the Hadar HaCarmel district. Haifa was thus, for all practical purposes, divided into two. During the Second World War, the German members of the Society of the Temple were evacuated. After the war, there was continuing conflict between the Jewish underground organization Haganah, the British naval base, and the Arabs - a conflict from which Haganah emerged victorious.